Onkyo CS-N575 40W Network Music System. It features a stereo design that produces up to 40W of total power with its 2-way speakers. 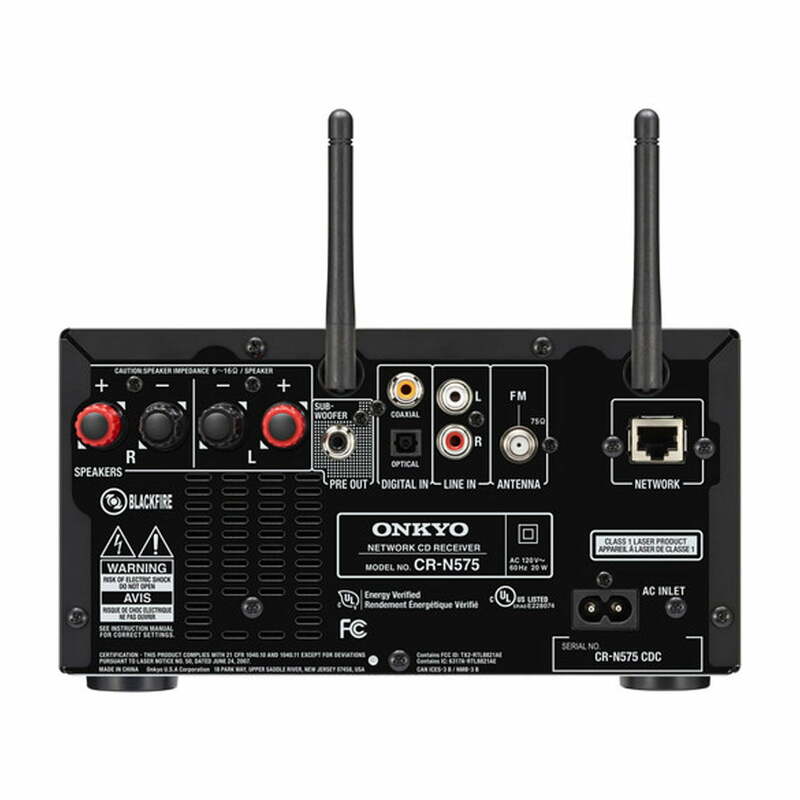 In addition to the aforementioned sources, the CS-N575 also features stereo RCA, digital coaxial, and optical inputs, allowing you to connect a variety of device types. 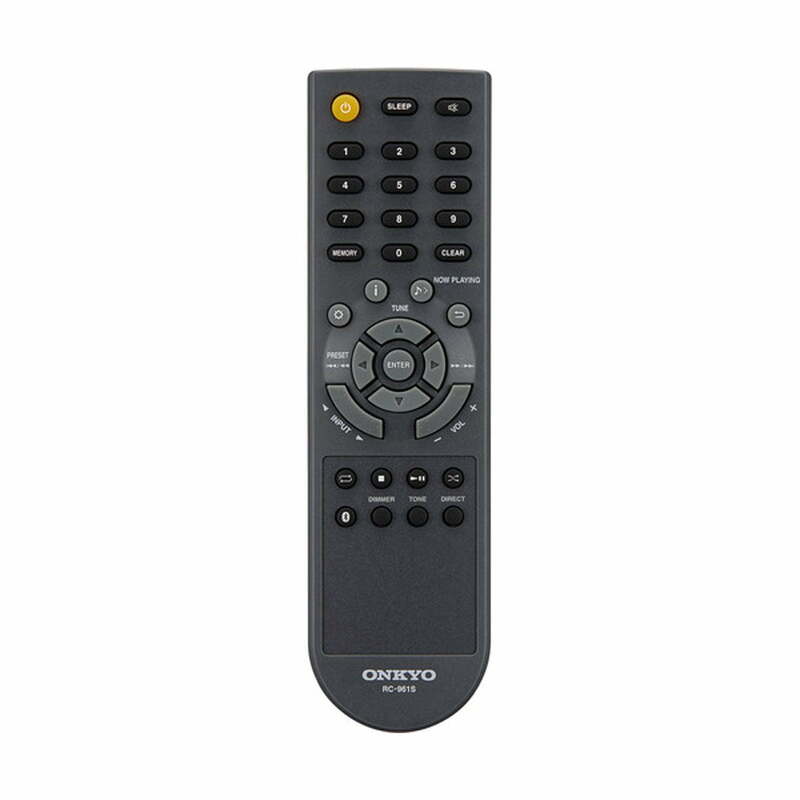 The USB input allows for playback of your digitally stored media from flash drives and HDDs. Stream music and control playback with Chromecast-enabled apps from your compatible device, such as an iOS or Android phone or tablet, Mac or Windows computer, or Chromebook. FireConnect is designed to mirror network audio and external analog sources connected to a master component on FireConnect-compatible speakers in other rooms. 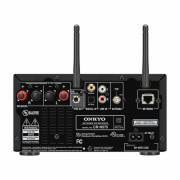 Music selection, speaker grouping, and playback management across the home are built into the Onkyo Controller app for iOS and Android devices. Built-in Wi-Fi provides access to Spotify, Pandora, TIDAL, Deezer, and TuneIn via the system GUI. 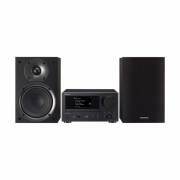 The CS-N575 features a switching amplification system designed to deliver high speaker-driving power, maximizing sound pressure levels for enhanced energy and punch over an expansive soundstage. Optimum Audio Control technology was developed to integrate amplification and speaker characteristics with factory DSP tuning for harmonized performance with augmented vocal range, dynamics, and clarity of detail. The accompanying 2-way bookshelf speakers each incorporate a 5.2″ pressed cone woofer made from natural pulp fiber that’s designed to be expressive of vocal nuances with deep bass. Soft-dome tweeters are fashioned to sound clean and unstrained in the high frequency range, with unwanted resonance absorbed by MDF baffles. The Onkyo Controller app supports system and multi-room playback control, the selection and distribution of on-demand streaming services, and more in one interface for iOS and Android devices. Plug a portable HDD or USB flash memory device into the front USB input and access your digital music using the JOG dial or remote control. Scan and save up to 40 FM radio stations for one-touch recall. 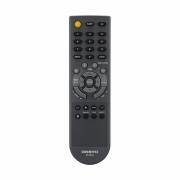 With Bluetooth wireless technology, you can tap and stream virtually any audio playing on your compatible device. The Auto Connect function and wake-on-signal detection help expedite your listening experience.